What can I say? Finally? Here it is at Number 13 for the Paperback NonFiction of the Los Angeles Times. God’s Hotel is being published in China, with a great cover! It has been three years since Oliver Sacks, my mentor and friend, died, and I’m happy to say that his sweet temperament and brilliant mind are being kept alive by many people, including Kate Edgar and Bill Hayes, who wrote this piece for the NYT. Marvelously, a beautiful animated film is being made of his life, for which a link can be found in the middle of the article. Sigh. “The well-educated professor Alberto Dolara, the one who first wrote an article using the term Slow medicine, starts his new paper on haste in medicine quoting the Divine Comedy written by Dante Alighieri. The poet synthetically expresses the negative effect of haste on every human action; even seven centuries ago hurrying up was seen as a hazard of spoiling the dignity of every action (Purgatory, Canto III, row 10-11):la fretta, che l’onestade ad ogn’atto dismaga (“the haste which mars the dignity of every act”). I just got back from an amazing trip to Europe, with talks in Geneva and Italy, and a vey special Roundtable with Carlo Petrini, the creator of the Slow Food Movement, and Alice Waters at the University of Gastronomic Sciences. La Stampa’s Carlo Grande was there and wrote an article on the event. The translation is by Professor Sarah Bigi, below. Let’s bow to nature and start a vegetable garden. It will also teach us how to live. Raise your hand those of you who have forgotten those “Technical education” classes in school, when we spent hours shaping pieces of iron, doing fretwork, or putting together a light bulb. For girls it was even worse: embroidery, home economics (so many boys could use some of that now! )… Apart from the importance of manual work and technics –today YouTube’s tutorials teach people how to screw in a light bulb – someone should teach us some gardening. 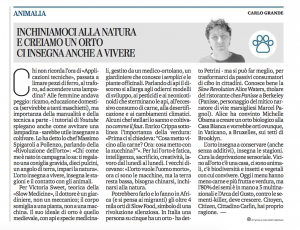 This is what chef Massimo Spigaroli claimed in Pollenzo, speaking about the “Garden Revolution”: “People like me, who were born in the country, know what I’m talking about: you get presents like a pregnant rabbit, or ten chicks, a small piece of land, and you learn about nature”. The garden is where you learn about life, seasons and animals. 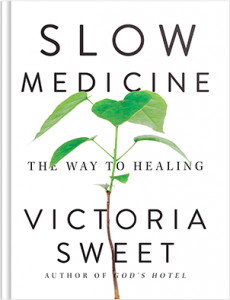 For Victoria Sweet, who has theorized “Slow Medicine”, the doctor is like a gardener, not a mechanic; the body is like a plant, not a machine. Her ideal garden is the Medieval one, with bees and curative ingredients, grown by a gardener-doctor, who knows simplicia and officinal plants. From bees, the conversation shifts to current development models, to pesticides and neonicotinoids that are destroying the bees, to excessive meat consumption, to desertification and climate change. Some top chefs know this and grow their ingredients comme il faut. Enrico Crippa underscores the importance of vegetables: “Once people would think: “What should I prepare to go with the meat?” Now: “What could go with the zucchini?””. For him, the vegetable garden is toil, intelligence, sacrifice, creativity, and hard work from Monday to Monday. The old people would say that the garden is the grave of a man [l’orto vuole l’uomo morto, literally: the garden wants the man dead, but it’s hard to recreate the saying without the rhyme], now we have machines, but the ground still lies down below, you need to bend, to bow to nature. This is what happens in more than 4.000 vegetable gardens developed by Slow Food in Africa (and the mind goes to migrants…), symbol of a silent revolution. In Italy one in five persons grows vegetables – said Petrini – but we could do more to go from passive food consumers to citizens. Someone who knows the Slow Revolution very well is Alice Waters, owner of the restaurant chez Panisse in Berkeley (Panisse, a character from the world of that extraordinary narrator of Marseillaise life who was Marcel Proust). Alice persuaded Michelle Obama to start an organic vegetable garden at the White House and would want to see vegetable gardens everywhere, at the Vatican, in Brussels, on Brooklyn’s rooftops. The garden teaches how to preserve (without preservatives), it teaches seasonality. It cures sensorial deprivation. Close to a garden there is a home, there are animals, there is biodiversity and insects and vegetables to live with. Today’s menus feature less meat and more fruit and vegetables, but 80% of the seeds is owned by five multinational corporations; the Ark of Taste, against killer-seeds, must grow. Citoyen, Citizen, Cittadino Carlìn [a.k.a., Carlo Petrini, the founder of Slow Food] you are really right. What’s the Hurry with Health Care? Andrea Firth just published this interview about Slow Medicine in Oakland Magazine. The quote in the title comes from Ninotchka.